The E35 excavator features a zero tail swing, auto idle, fingertip swing controls, as well as a hydraulic thumb and a floating blade. The bucket width is 18". Operating weight is 7500 lbs and has a 2800 lb lift capacity. We do offer flatbed delivery to your jobsite, rates vary by distance. 8hrs of running time are included with each 24hr rental period. Customers are responsible for fuel. 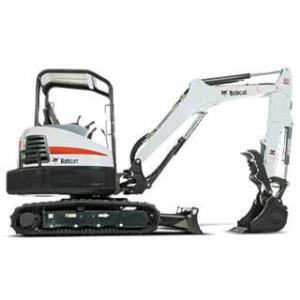 * Please call us for any questions on our mini excavator e35 bobcat rentals in Hillsdale and Ridgewood NJ.